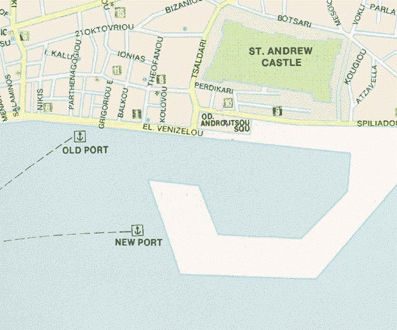 The port is located at Preveza, where the long main shopping street extends from the harbor in the South of the town. Preveza is a town in the periphery of Epirus, northwestern Greece, located at the mouth of the Ambracian Gulf. It is a commercial harbor and major tourist destination, and a tourist hub for the region. The ruins of the ancient city of Nicopolis lie 7 km north of the city. Preveza is famous for its ancient and historical landscape sights and roe caviar. Unlike many other seaside towns, it keeps much of its original charm, refusing to change for mass tourism. There are many great beaches near the town, and plenty of places for visitors to explore. In July, the town hosts a choral festival, and in the following month there is a festival dedicated to the sardine. The town is a marvelous place to wander, with its narrow, winding, pedestrian only streets and aging buildings. The Aktio–Preveza Undersea Tunnel was completed in 2002, and greatly shortens the travel time between the two sides of the gulf and the nearby island of Lefkada, also a major tourist destination. Across the narrow gulf is Aktion, and to the north is Nikopolis, the site of the Battle of Actium, where Octavius defeated Antony and Cleopatra. What was once a mighty fortress is now in ruins, but the Byzantine walls and the theatre remain today, as well as evidence of Roman baths and an aqueduct. The museum on the site has many artefacts from the period. Nikopolis is a must see for anybody interested in archaeology, mythology and history.